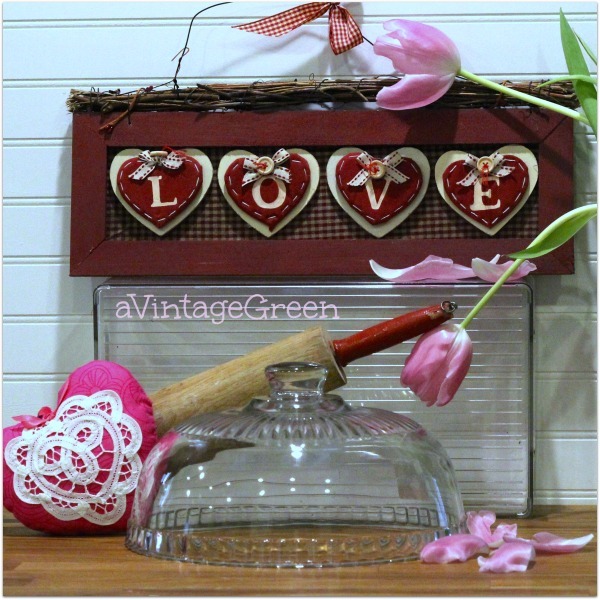 Found a 'LOVE' Valentines sign and a red handled rolling pin at the 50% off at one Thrift Store. The cake dome was found at the out of town Thrift Store and the heart pincushion was from an earlier Church Sale. The tulips are shedding petals. Wonderful update from Anne @ Phamily Blog on Feb. 4/16, She shared that the Cake Dome was sold by (house parties) Princess House as a hostess only item and the cost at that time was $75.00 and it could only be earned by a hostess. Most of their product back then was hand blown and made in USA or France or Germany. A 'final garage sale' in a very 'full of' junky rusty stuff double garage happened last Saturday. We had been to an earlier one three weeks ago and when the advert was in the paper we went again. 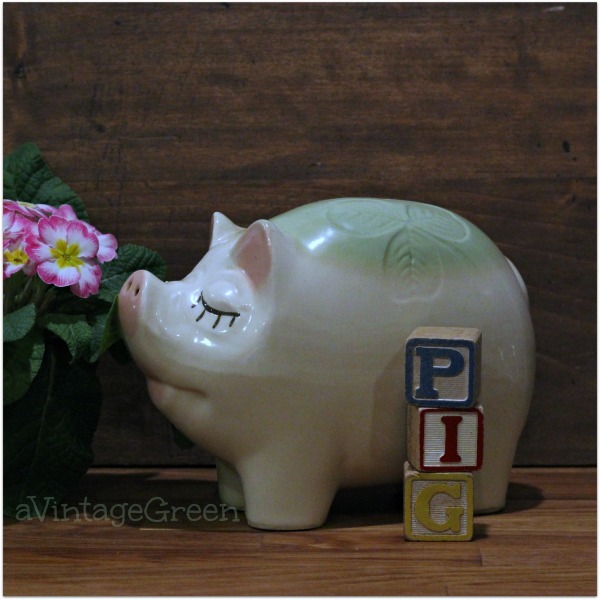 Who would have guessed that in with all the rust and junk there would be a Smiley Pig Clover Leaf Piggy bank. I picked the books up at my favourite out of town thrift shop and the rusty wheels, gate spring, lamp part, hook and clamp on things were in the same rusty junky garage sale as the pig. I LOVE rusty junky stuff. 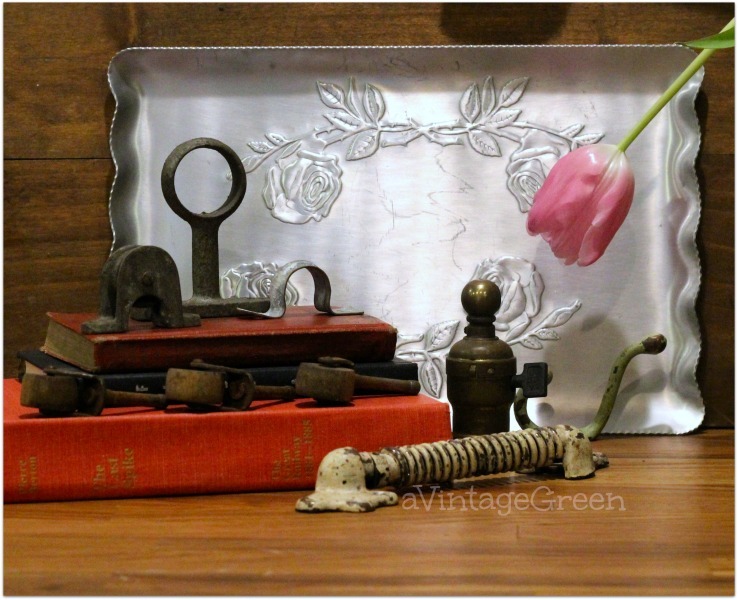 The aluminium tray with roses was from another thrift store that was having a 50% off sale day. Another friend is downsizing her china cabinet contents and brought a few pieces over. She has been collecting at garage sales, thrift stores and gifted items for a long time and just wanted to look at 'less'. The small copper piece is a 1/2 Gill measure, made in Canada. The spooner is marked Bristol England, the name on the bottom is Korean Art Ware. The duck is wooden and hand painted. 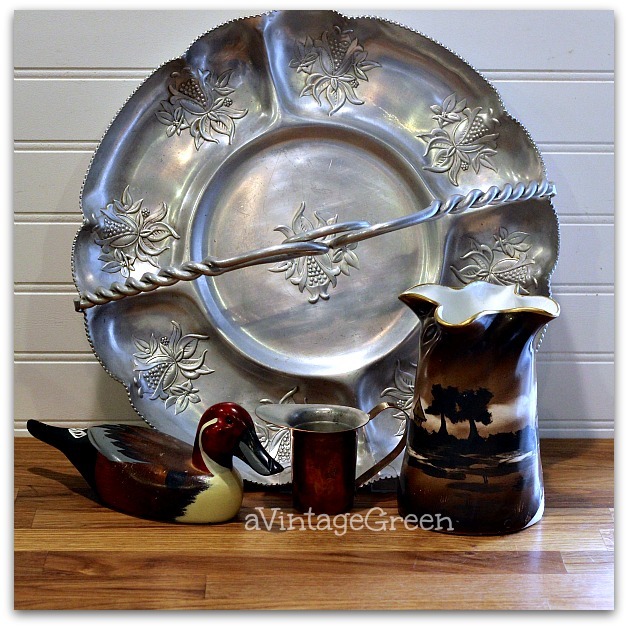 The background piece is a pressed aluminium handled serving dish, no mark. The Lidded Butter Dish is marked Grimwades Royal Winton Ivory England, the pink clover leaf shaped dish is marked Wedgwood England AR and the blue/lighter blue pitcher is marked Dudson Hanley England Vitrified Stoneware. The silver plate (most likely) toast holder has impressed marks I cannot read. 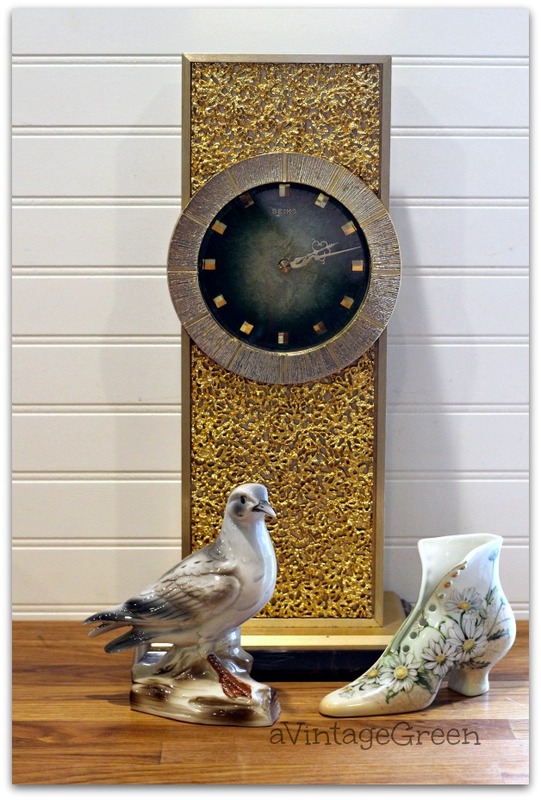 The tall Seiko Clock (battery) is a presentation piece. The Sea Gull is marked Bird Collection by Shafford 34K1 and the shoe is/was a hatpin holder is marked Limoges China. I sold Princess House for nearly 15 years and your cake topper is certainly a piece from their collection and it was a hostess item only so the value was $75 and you could not purchase it, only earn it as a hostess. Most of their product back then was hand blown and made in the USA or France or Germany. Lucky you, I sold one like that when I downsized at bay years ago and wish I had not done that. Everything today comes from China and the handblown items are usually from Mexico where the quality is very inferior. Handblown items are a dying art too. :-( You have some very lovely shares here. Have a beautiful weekend and thank you for sharing with us. Lots of great things, but I love that piggy bank!! What a haul you made! Lots of goodies! What great items you shared, Joy. I love that Smiley Pig:). I haven't been to a garage sale in a long time. Looks like you found some good items. You certainly can't beat the prices at a garage sale! We do not have garage sales much here anymore. If we do it is in the summer and they have nothing but clothes. Joy, what wonderful finds. I wish there would be a garage sale here! I am so ready for some rusty crusty stuff. Such great finds, Joy! 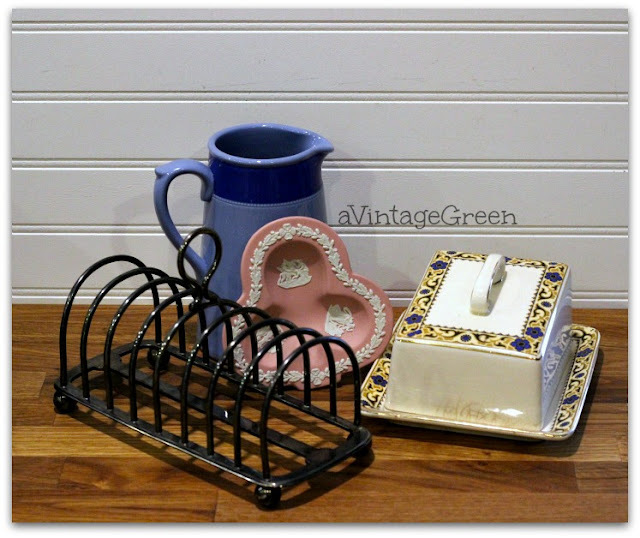 I hit my first garage sale of the season last weekend ;) Thank you for sharing @Vintage Charm! Wonderful finds Joy. I also love rusty stuff. The chippy white spring looking thingy is interesting. Love your smiley pig too. What a great find.